The last time I was in the big purple cow of the Udderbelly was very late one night after a few too many beers at the Edinburgh festival. It consisted of men in thongs, scantily clad women doing things with ping pong balls and a chainsaw. Luckily, Smashed, running as part of the Udderbelly Festival on the Southbank, is a very different affair. Performed by Gandini Juggling, a company formed over 20 years ago to fuse contemporary dance and mathematical notations in the field of juggling, Smashed is utterly (not udderly? – ED) delightful. 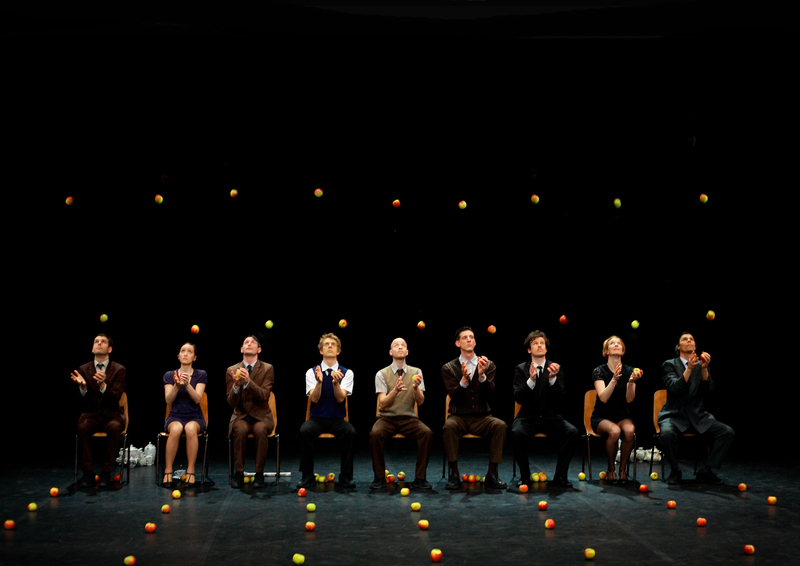 It’s perhaps hard to imagine how an hour of juggling could keep you so entertained, but the constant variations in pace, theme, tempo and movement styles weave an intricate story between the performers and without a word you are embroiled in their loves, loses, competitions and seductions. Smashed falls somewhere between circus, contemporary dance, symbolist theatre and mime, but works hard to effortlessly fuse these strands to create a family friendly, entertaining and deeply likeable piece. The company of 9 performers enter their apple strewn tea party all smiles and poised precision. But it is soon apparent that not all is going to go to plan, and with wit and extreme dexterity, proceedings literally start to fall apart. The speed and complexity with which the jugglers perform is astonishing, especially during the group routines, and the performers’ expressions and precise movement tell a playful story of gender politics and everyday power struggles. The influence of Pina Bausch is clear to see throughout; short scenes investigating male and female interaction, scrutiny of bubbling personal tensions, intricate composition and concise choreography that is rich in symbolism, playful use of repetition and even the muted tones of the formal costumes and popular soundtrack. It’s a thoughtful tribute to her work. Smashed is an entirely charming, intelligent and unusual performance, with a delicious spark of anarchy that is well suited to the Udderbelly cow. And there’s not a ping pong ball in site.